Bhutan (pop. 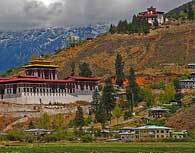 801,000; GDP/cap US$983) is a landlocked country surrounded by mountains, bordered by China to the north and by India to the south. The population is estimated to be around 896,000 and about 90 percent of the population lives in remote areas. King Jigme Singye Wangchuck has ruled the country since 24 July 1972. Women in Bhutan have equal status to men not only in the eye of the law but also in the home. 70% of the land is owned by women, due to the country's matrilineal inheritance system. In World Bank's Challenges and Opportunities for Private Sector Development, firms say that although land is not always easy to obtain in Bhutan, access to land is not a major issue. Rather, shortages of skilled labor, bureaucratic burdens, costly and unreliable transport are some of the major complains of the firms. The Government has declared its firm intention to maintain a 60% forest cover and 26% in the form of protected areas, even at the cost of economic opportunities foregone.